There are a few things in life I'm good at. I can draw remarkably accurate Disney characters, I can sing Busted's Air Hostess in Spanish and I have a fairly wonderful sense of direction. The final element of my life I am exceptionally proud of, is my skincare routine. No matter how trolleyed I am, if it is 6 in the morning and I am on my hands and knees on the bathroom floor, you can bet that by the time I'm in bed, my make up will be completely off and my 'hydrating night gel' will have been applied. And, on those other occasions (I like to think the majority of my life) where I'm not steaming drunk, I have got my routine down to a tee. None of these are product placement or sponsored items, when it comes to skincare I am fully devoted to finding the perfect bits and bobs for my skin, so I wouldn't ever discuss or share a product I didn't fully rely on. As my skin is dry, most of my products are hydrating and replenishing ones, which may not be suitable for oily skin. 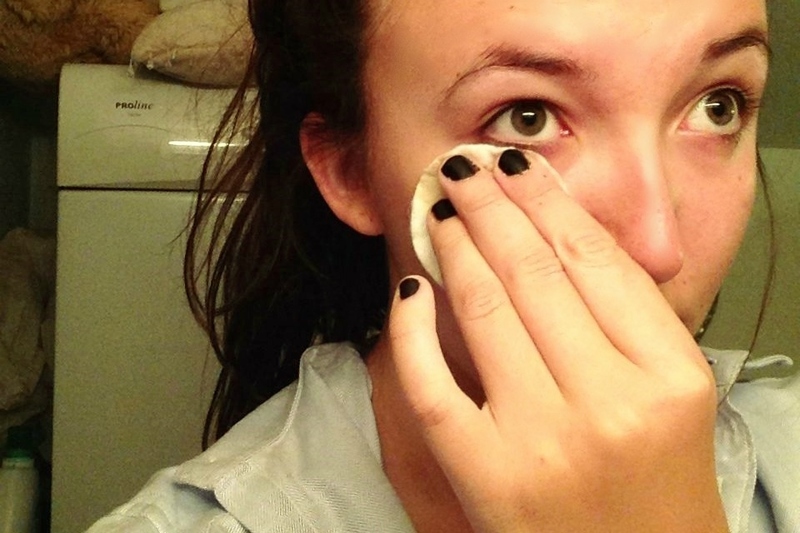 As much as I can, I try to remove my make up with cotton wool and an eye make up remover rather than a make up wipe. At the moment I use Estee Lauder's make up remover, but to be completely honest, I'm not particularly snobby, so long as it works and keeps my skin oil free. When I first started wearing make up, my mum always said to swipe in towards your nose rather than out to avoid wrinkles, and it's always stuck with me. Once I'm free of most of the make up, I rinse my face with warm water and use a tiny bit of Clinique's 'Liquid Facial Soap' to cleanse my face. 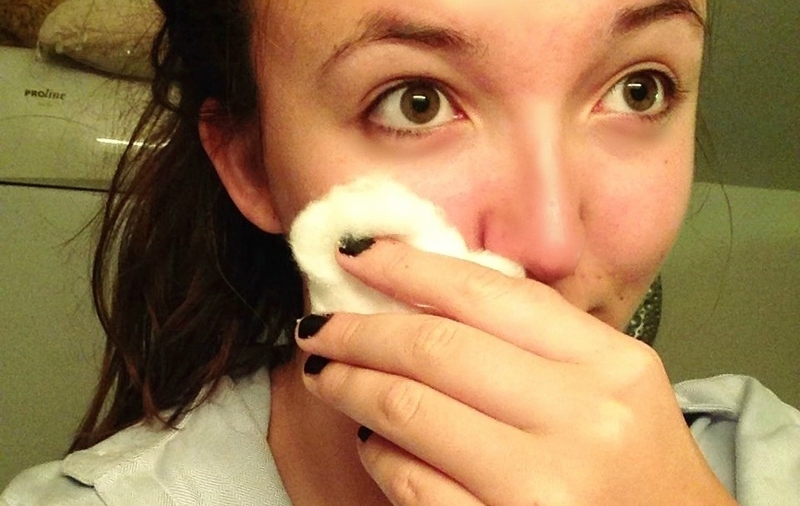 Next, I use Simple's 'Soothing Facial Toner', and apply it using cotton wool. 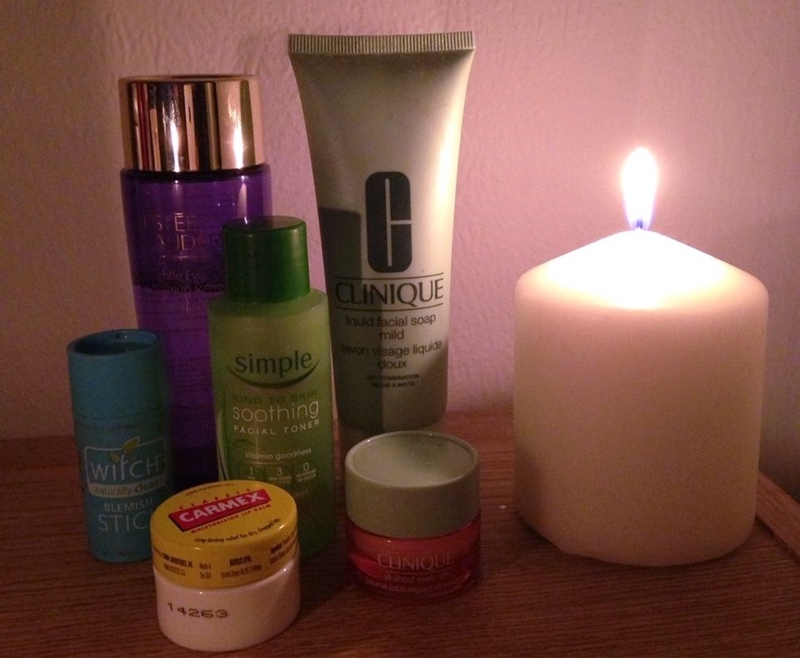 I am a huge advocate of Simple products, they seem to work a treat for me and my skin always feels so fresh even if I've had a bit of a grotty day. My skin is generally quite clear, but if I am getting redness, spots or blemishes, I turn straight to my 'Witch stick'. My Witch stick is my life. I've had several now since I was about 15 and I rely on them 100% when it comes to spots. If you're like me and don't need to use it every night, I would definitely recommend buying one. They're perfect for one off spots, or people who maybe break out during their time of the month. They're natural products made with witch hazel and tea tree oil, and oh me, oh my, they work an absolute treat. Sometimes it stings a tiny bit, which is why I wouldn't recommend using it if you have acne or are prone to spots and blemishes, but for one off's, it is an absolutely divine product. Under my eyes, I apply 'All About Rich Eyes' by Clinique. Up until a couple of months ago, I never bothered with eye cream, as I've never had bags and I was just a bit unsure of what exactly it did. But now I've started, I would never go back. When I wake up my eyes are so much less puffy and are visibly brighter, I honestly can't tell you the difference. I've had this Clinique one since the beginning and I'm tempted not to change, I've got the attitude if it isn't broken, don't fix it, and I'm so happy with the cream I have, I'm worried if I do change I'll regret it! The final skin product is my go to moisturiser Clarin's HydraQuench. I actually used my final bit last night, which means I have none to show you. As I said, I have dry skin and am an absolute moisturiser whore. There's no two ways about it. I am unfaithful to any moisturiser. Or I was, until I found this one. I think I've heard Zoella also rave about it in one of her favourites and she's absolutely right to. I picked it up as I just thought 'Quench' sounded exactly what I needed, and I've never looked back. I will be popping into boots to buy my next pot as soon as I have a spare second. Finally, just as I am about to get into bed, I use Carmex on my lips. Carmex is the best lip balm brand ever to exist in the world, I don't know what I did without it. I hope you enjoyed this post! It's not a typical Alice's Antics one, but I thought it'd be nice to do something a bit different, and I absolutely love reading about others skin care regimes! Today is my sisters birthday so as you read this I am probably entering a food coma from too much cake. I love reading this kind of stuff too, and I'm definitely looking into that Witch Stick! Daytime , evening, night, party, wedding etc are the times when we carry different and suitable makeups. Its much more important to remove make up wisely than to apply it to maintain skin and its health. Loved your stuff and we will always hope for the same in future too. Keep sharing!! !